Powered by the robust industrialization trends, Service Robotics Market has been escalating at an astonishing rate over the recent years. 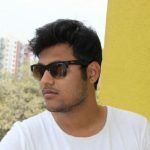 The technology has established its stance as an interface between industry and service sector and has garnered a mass popularity across a plethora of domains like defense, healthcare, entertainment, household, and logistics. If reports are to be relied on, the commercialization matrix of the business space has taken a prominent turn in the recent years, courtesy – the significant proliferation of IoT, cloud, Artificial Intelligence, and machine learning. The rising demand for robots with advanced capabilities to assist humans in everyday lives is anticipated to drive the service robotics market over the forecast timeline. The emerging trend of innovations from many engineering and scientific disciplines and technological advancements such as AI, machine learning, 3D sensors, machine vision, and big data analysis further contribute to the industry demand. In addition, the increasing penetration of robots in military & defense applications followed by the significantly rising defense budgets across the major economies is providing an impetus to the service robotics market. The growing deployment of robots across households is anticipated to showcase a positive impact on the service robotics market growth. The household robots help in reducing the burden on their human counterparts by performing domestic tasks such as floor & window cleaning, vacuum cleaning & lawn-mowing and letting them focus on more important tasks. Increasing penetration of entertainment robots in various sectors, such as retail, BFSI, and hospitality, enables the interactive experience deepening the engagement with in-store customers. The robots can bring in a transformation by making use of advanced technologies such as facial recognition, speech recognition, and emotion recognition. However, factors such as rising R&D expenses and capital investments are expected to limit the industry demand. Increasing utilization of healthcare robots in applications, such as surgeries, diagnostics, monitoring, and mental & physical therapy, will drive the healthcare service robotics market growth. Hospitals are increasingly using robotics in rehabilitation activities, which include orthotics and assistive devices such as wheelchairs. However, the demand for robotics in the logistics sector is on the rise owing to the growing e-commerce sector followed by the increasing efforts by industries to reduce the labor cost & optimize the processing speed. 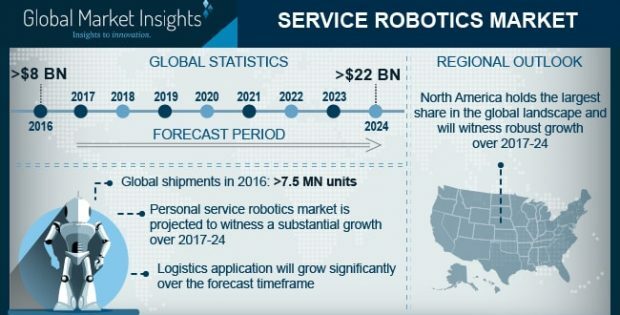 The U.S. service robotics market is anticipated to witness growth over the forecast timeline. It can be attributed to the rising demand for robots across various sectors, which include defense, logistics, healthcare, agriculture, and households. Increasing number of players entering the marketplace with new & advanced technological features further contributes to the regional industry demand. Moreover, the increasing adoption of household robots for performing everyday tasks coupled with the rising wage rates across various economies is compelling the adoption of robots, contributing to the Asia Pacific service robotics market. Speaking of the competitive landscape, service robotics industry is highly fragmented in nature with the participation of leading players like Parrot SA, 3D Robotics, Softbank Robotics, AeroVironment, Inc., DJI, Intuitive Surgical, Inc., Bluefin Robotics, and Samsung Electronics. Quite conspicuous from the aforesaid trends, these industry participants are increasingly focusing on developing technologically advanced products with enhanced functionalities in tandem with the tried-and-tested growth strategies such as R&D, collaborations, M&As, and product expansion. All in all, with organizations progressively looking to tap into the power of robotics for customer service, the global service robotics market is certain to bag massive proceeds in the years ahead. The presumption is aptly validated by Global Market Insights, Inc.’s forecast which claims service robotics market share to exceed a valuation of USD 22 billion by 2024.